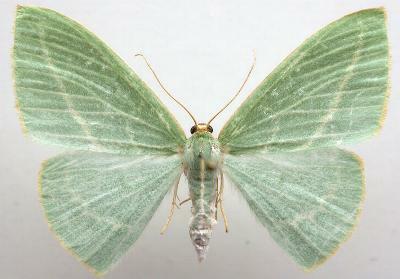 The adult moths of this species are basically green so that they belong to the group called 'Emeralds'. For this species, each forewing has a smoothly curved white sub-marginal line. Each hindwing has a jagged curved white sub-marginal line. The abdomen also has a white dorsal line. The wingspan is about 4 cms. Volume 9, Part 9 (1857), p. 366, No. 580. Entomological Society of Victoria, 2012, pp. 34-35.